No one denies that the institution of collective bargaining between workers and employers has been a powerful tool for social dialogue. Without our history of effective collective bargaining there would be no mutual understanding, no industrial peace, no constructive cooperation between social partners. Yet there is a feeling today that this history has drawn to a close; that our post-industrial world demands something different, something our tradition of collective bargaining and collective agreements cannot give us. What information and insight can we gather to verify or challenge this feeling? This was the first major question addressed by the distinguished delegates to the twenty-seventh World Congress of Labour and Social Security Law held at Montevideo, 2¿5 September 2003. The aim of the conference was to discover current problems regarding the existing structures and functions of collective bargaining in industrialized countries today¿problems readily identifiable in the context of economic globalization, falling union density, the increase in atypical and knowledge-based workers, and the ¿tertiarization¿ or declining economic importance of manufacturing-based industry. This bulletin contains some of the most important papers devoted to this major theme of the conference. It presents twenty national reports, each written by a scholar well-versed in the law and practice of collective bargaining in the country covered. 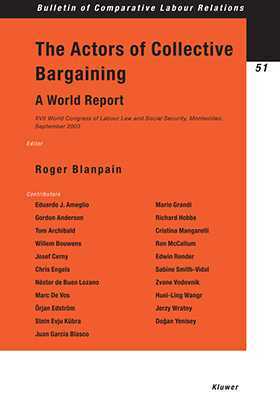 Two introductory reports deal with such general issues as the varying competences of representatives under different legal systems, labor union representation within the public sector, the development of collective bargaining in EC law, the levels and structures of collective bargaining practice, and the widening gap between the relevant legal norms and real situations. The national reports were drafted on the basis of a questionnaire, which appears as an annex. This allows the reader to easily compare the solutions set forth for consideration in the various countries under review. The Actors of Collective Bargaining will be of great value for all practitioners and academics in the field of industrial relations.